This just makes my blood boil. In North Carolina, vandals broke into the local Republican Party headquarters and took a marker to a mural of Ronald Reagan. They drew an upside down cross between his eyes… the tatted tears of a criminal by his right eye… ‘SSR’ down the side of his face and an ice cream cone on the other side (I have no idea what that is supposed to represent). That’s immensely disrespectful and was no doubt done by some young Marxist leftist. Reagan is arguably one of the greatest presidents in our history and this is just beyond shameful. 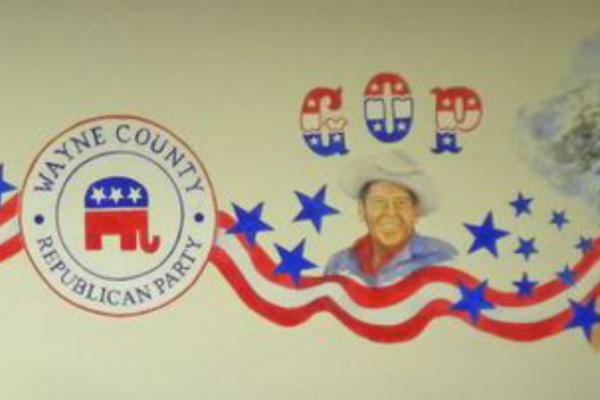 They kicked in a back door of the Wayne County GOP to get to the mural. Nothing was taken, but repairing the damage will be very costly. I guess they are trying to determine if there is any surveillance footage, so they can go after whoever did this. Before the election, someone firebombed a GOP office in Orange County. No one was injured in that October case. This was probably a swipe at Republicans in general, Reagan and President-elect Donald Trump. Police in North Carolina say someone broke into a local Republican Party office and defaced a wall mural of former President Ronald Reagan. A Goldsboro police report says the break-in was discovered Thursday. Police say a door was kicked in at the building housing the Wayne County GOP. The report says nothing appears to have been stolen, but the vandalism caused hundreds of dollars in damage. Police Maj. Dwayne Dean says investigators asking nearby businesses whether any surveillance video exists. 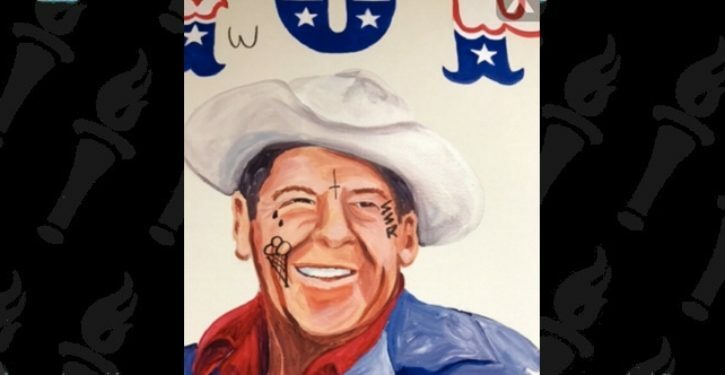 The Goldsboro News-Argus first reported the vandalism that includes obscenities and symbols drawn on the painting of Reagan’s face (http://bit.ly/2hCduUv ). It appears a pen or marker was used. They also scrawled profanity on the art. Classy. I so hope the police catch whoever did this and throw the book at them. If these kinds of attacks keep up from the left, it is only a matter of time before someone gets seriously hurt or killed. North Carolina seems to have real issues these days. The portrait was part of a mural that also includes the North Carolina flag, elephants and an image of the World Trade Center burning on Sept. 11, 2001. Reagan is shown in a cowboy hat. The intruder scratched out the word “Republican” and replaced it with an offensive slur used to describe gay people, Wayne County GOP Chairman Brent Heath said. This has to be stopped and soon. These thugs are totally out of control and are giving the middle finger not only to conservatives, but to law enforcement. This won’t end well.